The camera application has several tools and options that let you to capture photos that are visually. Some camera interfaces arrive with filters, whereas there are some that allow you to manually fine-tune the exposure and focal length. Basically, there are several editing tools these days that provide powerful options to edit the snaps that you capture. But, an ability that is missed out by the default Android camera app is adding timestamps to the old photos to know when you have clicked them. This will add data and time to the images helping you know when you have clicked a particular snap. If you are looking for some apps that will add timestamps to the snaps you have captured using your Android device, here is a list of applications that will help you do the same. Vignette is a popular application that is available in both free and paid versions. 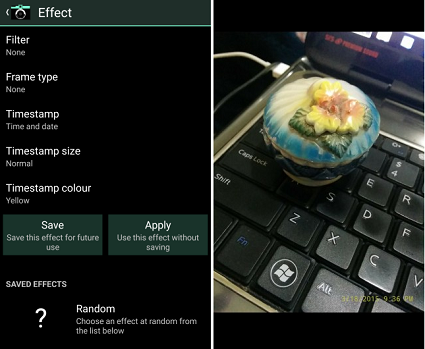 This application helps you in adding custom filters and effects that will create visually stunning photos. The free version also lets you to add a date and time stamp to your photos and there are several options that help in customizing the stamp such as choosing the color of the stamp as well as its size. You can also add either the time or the date to the photos based on your requirement. The quality of the photos can also be chosen. As it is a free version of the application, there are some ads in it. APD TimeStamp help in adding a time and date stamp to your photo, but it is not the best one in terms of interface or customization options. 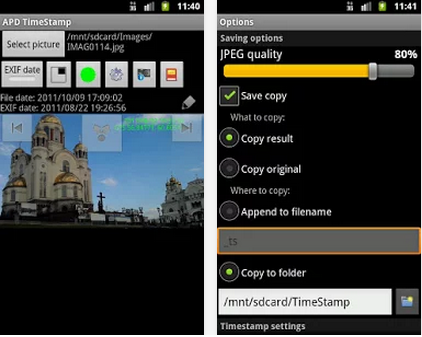 Unlike several others, the main purpose of this app is to facilitate in adding a time stamp to your photos. Eventually, this application does not have photo capture functionality. With this app, you can add date and time stamps to the photos that you have taken before. It basically uses the EXIF data of the photos to add a time stamp. The application also helps you in entering your own custom date and time as per your requirements. Camera Timestamp is a functional camera app that prints a data and time stamp as well the location details on the photos that you have captured. The application is available as a free trail version that supports adding the timestamp to 10 photos and a premium version as well. You can customize the time stamp and location settings such as format of date and time, color and size of the timestamp, text location, text outline and geostamp that adds the location. 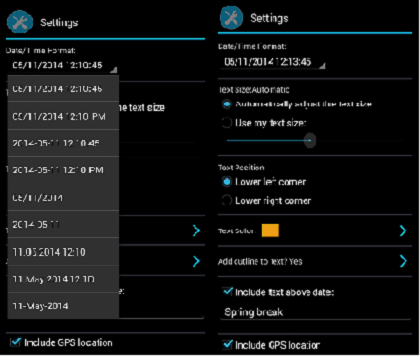 However, the location feature is optional and you can enable it if you want. These applications that we listed above are some that help in adding a date and time stamp on the photos that have been taken using your Android device. You can try these apps to add the timestamps on your old photos and know when you have captured them.